One Sunday morning in April I had just started descending Pishill when I noticed I had a front wheel puncture. I knew this because I could see a thin stream of tyre sealant jetting out as the wheel spun. Interesting, I thought, what happens next? After a slightly longer time than I would have liked the visible stream stopped. I kept cycling and experimentally bounced some weight on the bars. The front wheel felt rideable. I kept going and not long afterwards had finished the Torture 40 without any stops. Rewind a couple of months to February and the RCC Reliability on a cold and windy day. The rear wheel flatted just after we turned West towards Clare Hill and I watched the group disappear up the road. A miserable roadside mending ritual ensued followed by a solo headwind slog to the finish. On the way home afterwards I flatted again. At that moment I resolved to try tubeless tyres because I was sick of this, I had done it too many times. A couple of weeks later I was in possession of the necessaries and installed a pair of Hutchinson Fusion 3 tubeless on my wet weather bike, the tyres that were to survive the puncture in April. In Tubeless tyres part 1 I described the basics of road tubeless and finished on a question - is it worth going tubeless? First things first: fitting the tyres to your wheels. I covered this in Part 1 but to summarise: ideally you're starting with a tubeless-ready rim and if the rim bed has spoke holes you need to tape it first with tubeless tape. Fit one side of the tyre, install the valve, then fit the second side of the tyre including some sealant as you do. Shake and rotate the wheel around to spread the sealant and then you should be able to inflate the tyre with a floor pump. Successful inflation is a satisfactory moment. By comparison with fitting clinchers, tubeless tyres are tight but no worse than many clincher/rim combinations. 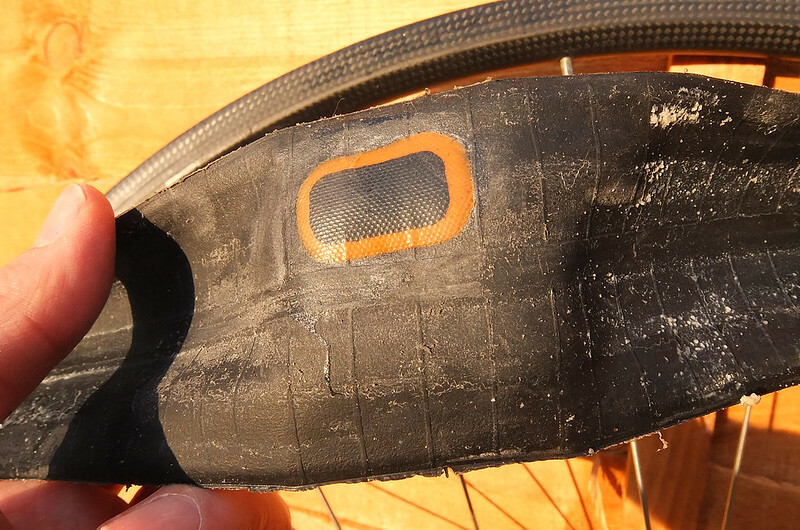 Not having to arrange an inner tube inside the tyre is a boon as is not worrying about trapping part of the inner tube under a tyre bead (a familiar experience for those who have used latex tubes). Using sealant is a new experience but has great benefits. It turns out that air pressure retention is very good, up there with clinchers, I'm seeing at most 10psi air loss over a week. I don't top up air pressure before every ride as is necessary with latex inner tubes. Don't look to tubeless to save weight. Whereas a normal race-oriented clincher will be 220g or so with another 80g for the inner tube, the equivalent tubeless tyre is about 300g on its own. When you add a valve and sealant, there's a small weight penalty. The ride quality however has a lovely springiness and is very confidence-inspiring. I don't think there is much impact on recommended tyre pressure, I would run a 23mm clincher at 90-100 psi and I do the same with tubeless. Search on YouTube and you'll find videos where Stan shoves a nail through a tubeless tyre, removes it and, magically, the tyre does not deflate. The escaping air is blocked by sealant. 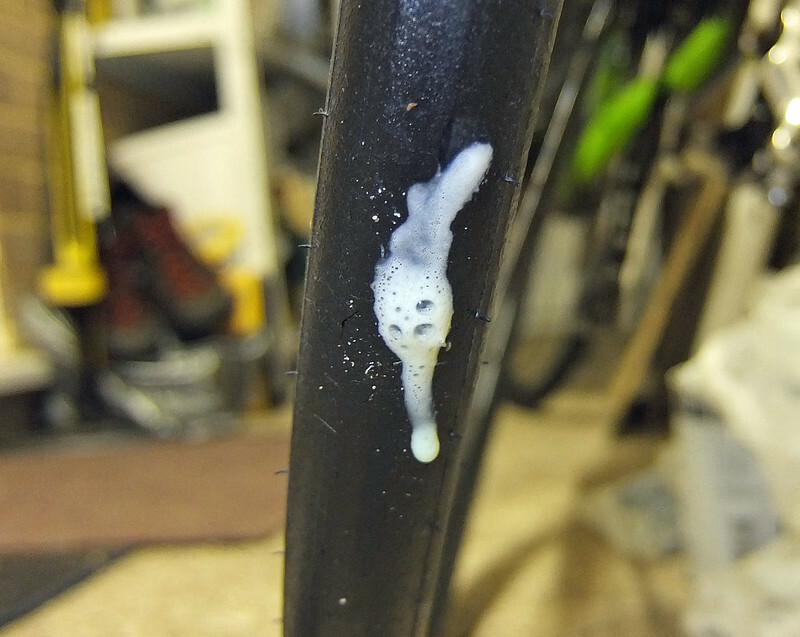 Sealant is a key part of the tubeless recipe yet is the thing that is most alien to road cyclists. It's a rubber solution emulsion that is drawn by escaping air into any tiny gap where it solidifies and stops the leak. As well as fixing punctures sealant is important in forming the airtight seal of tyre bead with rim. There is after all 4 metres of tyre/rim junction per wheel to be kept airtight. Does sealant really prevent punctures? Yes, it does, within limits. Consider the various categories of puncture experienced by a clincher tyre, all of which would necessitate a roadside stop, and how tubeless compares in the same scenario. -	The signature puncture of a ride in the Chilterns, especially in wet weather, is an intrusion caused by a tiny shard of flint. Sealant is very effective against these albeit with an air pressure loss. When I finished my Torture 40 ride I discovered that the front wheel pressure had fallen from 90psi to 45psi. On other occasions I have discovered similar pressure losses. The important part, as far as I'm concerned, is that these incidents didn't leave me stopped at the side of the road getting cold and my hands dirty. The bike remained rideable and I could pump the tyre back to full pressure when convenient. No further repair is necessary, the intrusion stays sealed. -	Small cuts up to 2mm. This is a bigger wound to the tyre. On a clincher you may need a tyre boot to prevent the replacement inner tube bulging and puncturing. With tubeless you have a good chance of the tyre retaining a low level of pressure, allowing you to limp home. The tyre can be repaired back at base. Oh no my tyre is bleeding! -	Larger slashes. Tubeless isn't magic, you're as out of luck here as you would be with a normal clincher. The fallback repair is to remove the tubeless valve and fit a conventional inner tube. This is more of a hassle than an inner tube swap on a clincher tyre but it is feasible and I have successfully done it at the roadside. -	Pinch flat (snakebite puncture). Travelling at speed you hit a rock and suddenly you're riding on the rim. This is a pinch flat, caused when the rock thumps the tyre carcass hard enough to pinch the inner tube damagingly against the rim. Tubeless is much less vulnerable to these. In this year's Reliability trial I hit a pothole very hard and the tyre survived without damage, on a clincher a hit of the same force would have been a guaranteed flat. -	Flats due to incorrect installation of inner tube, eg pinched during installation, trapped under the tyre bead. No equivalent problem with tubeless. After a year on tubeless I feel a greater sense of security against punctures. It is much less likely that a ride will be spoiled by a frustrating stop and that makes me a happier person. I'm not binning an expensive tyre for one little cut. If the integrity of the carcass is not destroyed then it is repairable. The method is to patch the inside of the tyre. Velox make a specific kit for tubeless repair that has strong patches and uses cyanoacrylate (superglue) to stick the patch to the tyre. The dense patch makes sense because the patch needs to hold against the air pressure inside the tyre. The cyanoacrylate glue I'm not so convinced about, it's not flexible and being constantly bathed in wet sealant is going to weaken it. I had cause to revisit one of these repairs and the patch was a leaky mess after some months of use. However another tyre repair is surviving fine. These patches would also be useable on normal clinchers. In your long years with inner tubes, the valve was just the lumpy bit attached to the rubber but it comes into sharp focus with tubeless where the valve is a standalone part. You can tell you're a tubeless geek when you start developing opinions about these valves. 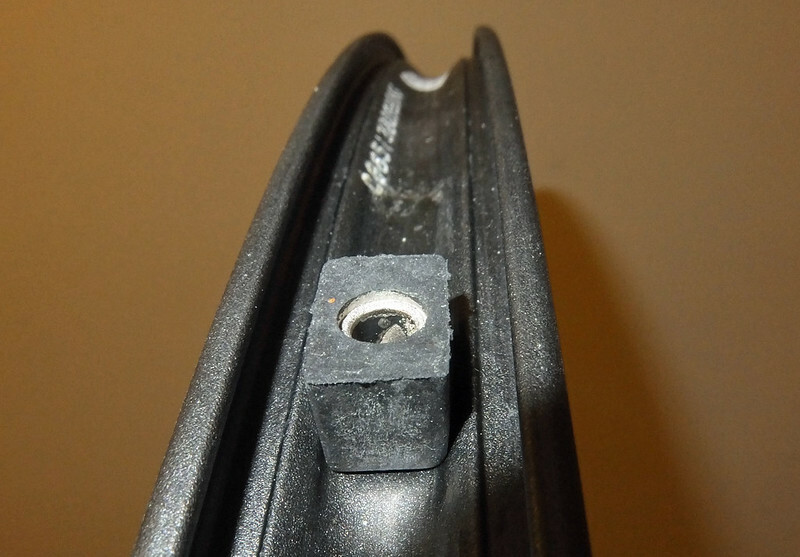 The tubeless valve base is rubber and has to form a seal against the rim hole. It will have a removable valve core, this to allow sealant to be injected into the tyre through the valve with the core removed. You must use the external threaded washer to keep the valve tightly in place even if previously with inner tubes you'd have felt that was frowned on by 'the rules'. You need to periodically check these washers for tightness and because of this ideally the washer is heftier than the type supplied with an inner tube. If you want to run tubeless on deep section rims you have to use a threaded valve extender which to date is only available from Stan's. There is a lack of support for tubeless from the most familiar tyre suppliers. Tubeless adoption will take a big step forward on the day you can lay your hands on a GP4000 or Pro4 tubeless but for the moment Conti and Michelin are not playing. Here are some of the players as of early 2015. Hutchinson are the original purveyors of road tubeless and their Fusion 3 remains the reference tyre in this class. Intensive is a heavier duty winter tyre. Secteur (or Sector) is an interesting 28mm yet relatively light tyre intended for mixed surfaces. Schwalbe are recent to the road tubeless scene but when I tried the Ultremo ZX I thought it was electrifyingly good; I've been using it for time-trialling. That's already been superseded by the grandly-named One which is available in a variety of widths. It's an excellent tyre, hard to better. There are also options from Bontrager and Maxxis. Whichever you choose, they are hard to find and you will likely end up buying on-line. For items such as tape, sealant and valves, Stan's Notubes is the brand you'll come across and find in shops. www.superstarcomponents.com and www.justridingalong.com are useful sites. Road cycling is undergoing another technological step forward with the arrival of bikes with disc brakes. In the context of an emerging specification for bikes with disc brakes, wider rims, wider tyres running lower pressures, ridden not only on tarmac but on other surfaces, tubeless sits well as a means of increasing reliability, ride quality and enjoyment. My experience is that tubeless manages to combine performance with reliability in a way that clincher tyres have never done. Tubeless is a practical everyday option and I think there is a lot of potential for further development. I won't be going back to inner tubes.